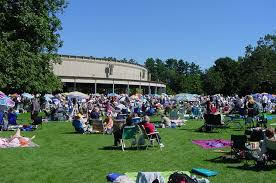 A survey of four concerts at Tanglewood so far this season brings to mind at least two distinctions that set this summer home of the Boston Symphony Orchestra apart from many other music festivals: the diversity of its programming; and the wide age range of both its performers and its audience. Before the official BSO season opened in the Koussevitzky Music Shed, for example, Keith Lockhart led his Boston Pops (which includes many BSO members) in a wide-ranging program entitled “Simply Sondheim” of mostly vocal selections by the greatest living composer/lyricist for the musical theater, Stephen Sondheim. Featured Broadway stars Kate Baldwin and Jason Danieley were both in glorious voice, but the six Tanglewood music fellows who joined them were equally impressive at the start of their promising careers. Special kudos go to baritone Davone Tines for his comic and dramatic turns respectively in “The Woman’s Mine” from “A Little Night Music” and “Losing My Mind” from “Follies.” The music thrived from the full symphonic treatment rarely accorded to Broadway scores. In the more intimate Ozawa Hall, the Boston Symphony Chamber Players (nine BSO members) and pianist Randall Hodgkinson opened their concert with a 2014 BSO commission, “Why Old Places Matter,” for oboe, horn, and piano by 32-year-old former Tanglewood Music Center fellow Eric Nathan, who took a bow after the lively performance of this charming piece. The program concluded with sparkling accounts of Nielsen’s Quintet for Winds and a chamber arrangement of Brahms’ orchestral Serenade No. 1. At “85 years young” (according to the program notes), legendary American pianist Leon Fleisher was the star of another Ozawa Hall concert, which also featured his wife and piano-duo partner Katherine Jacobson. After glowing accounts by Fleisher of short pieces by Bach and Debussy, the duo offered lovely four-hands renditions of Brahms’s first set of “Liebeslieder” Waltzes and Schubert’s Fantasy in F minor and closed with a shattering version of Ravel’s “La Valse.” It was heartening to see so many students in the audience whom Fleisher may have taught in his many years on the Tanglewood Music Center faculty. But the biggest crowd so far at Ozawa Hall turned out for the Lincoln Center Jazz Orchestra, whose leader, trumpeter Wynton Marsalis, was also a genial host. Their repertoire included both classics, like Wayne Shorter’s ballad “Contemplation” in a touching arrangement by LCJO saxophone player Ted Nash and original compositions by band members like trombonist Chris Crenshaw, who also joined fellow trombonist Vincent Gardner in showing off their vocal chops. The second installment of this three-part series will appear next week.